The Law Offices of Daniel Timins helps individuals develop estate plans to protect their family’s assets, maintain their dignity and health care needs during life, and ensure proper distribution of their estate thereafter. Dan is not a general practitioner, but rather an Estate Planning Attorney. He works for you and with you, to show that estate planning should be a process whereby you learn about your options, articulate your ultimate desires, get a full picture as to the nature of your assets, and learn how and when to inform future generations of your estate plan. He does more than talk; he listens to you so that your estate plan is made in your vision, with your best interest in mind. A flexible and carefully-constructed estate plan should ensure that a person’s desires are actualized, and that his or her spouse has both access and control over the financial assets, while simultaneously saving money on taxes, and taking steps to ensure future beneficiaries are protected from potential creditors. Dan familiarizes you with the concept of estate planning, discusses your wishes, your family situation and health, and reviews drafts of your documents with you. He then strategizes your grander estate plan, and executes both legal and non-legal documents in a way that minimizes future contests and controversies. 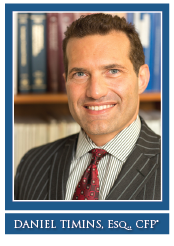 Daniel Timins is a graduate of Pace Law School in White Plains, and is a Certified Financial Planner®. He specializes in Estate Planning, Surrogate’s Court proceedings, Real Estate Law, Commercial Law and Medicaid Planning. To learn more about Dan read is bio HERE. Judith Volkmann, Esq., CFP® has been a mentor to Dan for many years. Learn why by reading her bio HERE. Brian Zimmet, Esq., is Dan’s Of Counsel and Springing Power of Attorney for his law firm in case something happens to Dan. If you would like to know more about Brian read his bio HERE. Do you need advice and consultation when it comes to elder law, estate planning, litigation, and probate? Please call Law Offices of Daniel Timins at (212) 683-3560 or fill out our client information form below.